Mikko Hirvonen of Finland and Jarmo Lehtinen of Finland compete in their M-Sport WRT Ford Fiesta RS WRC during the Shakedown of the WRC Germany on August 21, 2014 in Trier, Germany. TRIER, GERMANY - AUGUST 21: Thierry Neuville of Belgium and Nicolas Gilsoul of Belgium compete in their Hyundai Motorsport Hyundai I20 WRC during the Sakedown of the WRC Germany on August 21, 2014 in Trier, Germany. Andreas Mikkelsen of Norway and Ola Floene of Norway compete in their Volkswagen Motorsport II Polo R WRC during the Shakedown of the WRC Germany on August 21, 2014 in Trier, Germany. Jari Matti Latvala of Finland and Mikka Anttila of Finland compete in their Volkswagen Motorsport Polo R WRC during the Shakedown of the WRC Germany on August 21, 2014 in Trier, Germany. 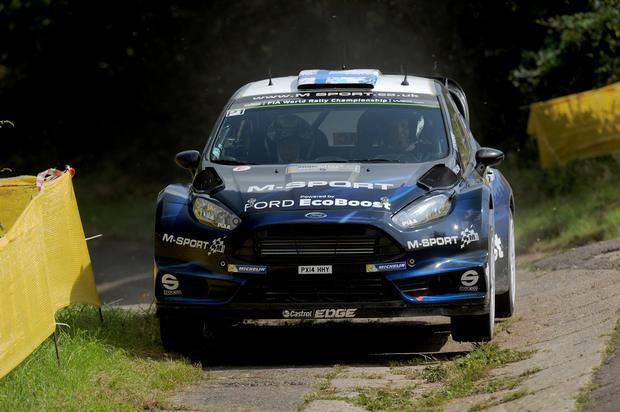 Elfyn Evans of Great Britain and Daniel Barritt of Great Britain compete in their M-Sport WRT Ford Fiesta RS WRC during the Shakedown of the WRC Germany on August 21, 2014 in Trier, Germany. The 4.60km Konz stage claimed Neuville's i20 on his third run though, taking the double left corner almost 1.7km from the start. The car rolled over six times before coming to rest among the vines. 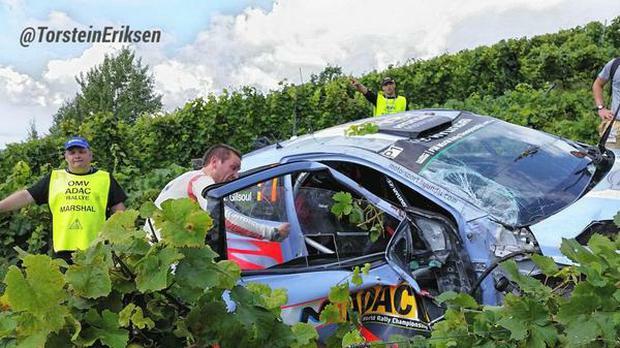 Thankfully Neither Neuville nor co-driver Nicolas Gilsoul were injured. Jari-Matti Latvala was quickest as his Volkswagen team claimed a 1-2-3. The Finn went fastest on his final run taking his Polo R 0.5sec clear of championship leader Sébastien Ogier with Andreas Mikkelsen a further 0.6sec back. Citroen’s driver Kris Meeke from Northern Ireland topped the times initially in his DS3 and the finished fourth overall, 1.7sec behind Latvala. Dani Sordo, winner on the German stage in 2013, and Mikko Hirvonen completed the top six in a Hyundai i20 and Ford Fiesta RS respectively.